American Homesteader Awning and Shade Inc. has been in business manufacturing awnings and shade products since 1981. We are proud to say we have manufactured for over thirty companies in the valley and throughout the United States. Our employees are among the finest in the industry, with over one hundred years of combined experience. Our seamster has worked in the industry for forty years and has been with us for over twenty years. We are extremely proud to have such talented and skilled professionals producing the quality products we are known for. Customer satisfaction is our number one priority. When you buy from American Homesteader Awning and Shade Inc, we guarantee you are getting a quality product made from the very best materials available in the industry. American Homesteader Awning and Shade Inc. We are your Phoenix AZ awning manufacturer, sales & installation specialist of custom-made awnings, roll curtains, window and entrance canopies, and shade structures. 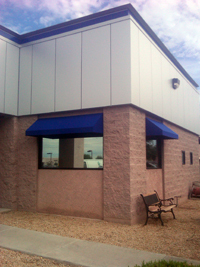 Custom awnings and shade structures for Phoenix metro, Scottsdale, Surprise, Cavecreek, Carefree, New River, Anthem, Tempe, Mesa, Tucson, Prescott, Goodyear, Apache Junction, CareFree, CaveCreek, New River, Camp Verde, Sedona, Flagstaff, Payson, Peoria, Sun Cities and Avondale Arizona!